Make a robot or a robo-car without the inner interference of the owner or any other person on the track. That means no remote controls or other exterior devices, other than the ones implemented in the robot’s software. The track is made from stone slabs. The grass on the sides of the track is restricted for the robots (or robo-cars). The track is roughly 3 meters wide and over 300 meters long. Introduce robotics to wider society mainly on the part of youngsters and to create or reinforce their relationship towards technology. Also it is possible to consider this contest like pre-round of a bigger parent outdoor robot competition, which is, of course, ROBOTOUR. The competition consists of 4 rounds. In each round, the measured length of the distance traveled with an accuracy of 1 m, and prevent tie time will also be measured. The total order to chose the best round carts. Everyone can participate with no difference of the age, only with an exception that participants younger than 18 years must be accompanied with a person older than 18 years which is responsible for the safe operation of the device. The organizer doesn’t bear any responsibility for possible damage caused by the contesting device. It is also prohibited that the device uses solid, liquid or gas fuels. The contestants can use liquid-based batteries or cells. Every robo-car must have at least one switch easily accessible on the top of the device. Every robot must be autonomous. It must have EMERGENCY STOP button which stops the robot immediately. The button must by easily accessible, red, and has to be a fixed part of the robot (aka Big Red Switch), so that it could be pressed easily in case of imminent danger. In the moment when the danger has passed, the attending person can unpause the robot with a second press and the robot can continue on its way. There has to be a way to manipulate with the robot easily: any two people have to be able to pick it up and move it several tens of meters away from the previous location. The device must travel three meter segment on the park path, the time is measured for allocation starting order. Safe start and safe stop of the device, to prevent the possible collisions with another device or a person, are rated and noted. - The track isn’t closed for public during the competition. It’s every contestant’s obligation to clear the devices path from possible spectators. - The expected starting interval of individual devices is 2 minutes depending on the number of contestants (can be lowered to 1 minute). - The track can’t be used to return to start but other paths in park can be used. The case when a faster robot reaches slower robot shouldn’t occur. If this event occurs, the faster robot can accept it as an obstacle, which means, he can try to go around it or wait until the robot gets out of the way by itself. The attending person has the right to stop the robot by the button and wait until the slower robot gets out of the way. In this case the time measuring does NOT pause. If the device gets out of the track (into the grass), the distance perpendicular to the track counts. Because in the middle of the park there is a free space, which is made of the same material as the rest of the track, the trial is terminated after reaching the end of this part of the track. But the distance travelled is again counted only upright to the track. This precaution is available only because some robots may be capable of getting back on the track and continue the trial. The device is still on the track when it has at least 2 wheels on the road (or 1 track in case of a track-based device). If leaving the track would happen somewhere else than just grass lawn (for example flower plot), the trial has to be terminated, so that the damage to the plot is prevented. After measuring the distance the device must leave the track as fast as it is possible which is done by the owner team. At the end of one concise information for those who did not know about the competition, or unable to attend. Last year competed 27 robotic teams and 7 toy cars. There were three German teams. 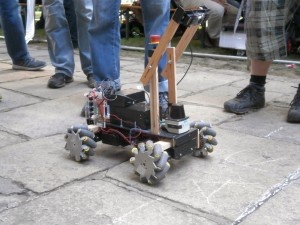 The competition here and the top teams from the competition Robotour, and many new teams. Attention! Registration for the competition RORO 2016 ended 20. 4. 2016!